Obituary – Lau, Alberta May (Lighty) « Perry High School Alumni Association, Inc.
﻿Alberta May Lau, 95, formerly of Perry, died Monday, Nov. 2, 1998 at Community Care of Laramie at Laramie, WY. Funeral was Friday afternoon at the First United Methodist Church in Perry. Rev. Tolbert Dill officiated. Burial was in Grace Hill cemetery. Casket bearers were Don Lighty, Paul Morrow. Everett Lighty, George Hill, Roy Morris and Dr. Starling Miller. Honorary casket bearers were Charles Kemnitz and John Kemnitz. A memorial was established to benefit the First United Methodist Church, 501 Seventh Street, Perry, OK 73077. Mrs. Lau was born near Piper City, IL on July 28, 1903. Her parents were Edgar H. and Ida May (Stanford) Lighty. The family moved to a farm near Lucien in 1907. 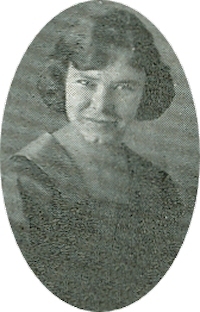 In 1915, the family moved to Perry where her father was employed by the U.S. Postal Service for many years. On June 20, 1927, she and John F. Lau were married. Most of their lives, they lived on a farm one-half mile west of Perry and together they managed the Farmer’s Exchange Grocery and Feed Store for many years. After they retired, Mrs. Lau worked several years as a hospital nurse’s aide. In 1969, she and her husband moved to Perry. She was preceded in death by her husband, parents and three brothers and two sisters-in-law, Roy and Lillie Lighty, Ivan and Nadine Lighty and Glenn Lighty. Survivors include a daughter and son-in-law, Dorothy and Don Bird, Laramie; one sister, Ruby Morrow, Perry; two granddaughters, Debi O’Donnell and her husband, Greg, Laramie, and Donna Crandall and her husband, Gary, Pine Bluffs, WY; five great-grandchildren, Chad and Cassidy O’Donnell and Shon, Jennifer and Megan Crandall; a number of sisters and brothers-in-law and a very dear friend, Elizabeth Sims.